The event brings hundreds of years of history together in one afternoon at Museum of American Armor at Old Bethpage Village Restoration. Old Bethpage, NY - September 30, 2014 - Nassau County Executive Edward P. Mangano invites residents to visit Old Bethpage Village Restoration (OBVR) on the weekend of October 11th and 12th to experience military history throughout the ages in one afternoon at the Museum of American Armor. Living historians will present uniforms, weapons and tactics that include Roman gladiators, Revolutionary War Minutemen, WWI Doughboys, a world class display of WWII armor and Vietnam War GI’s. This “Military Timeline” is an extraordinary gathering of world history presented in one venue during one weekend when visitors can get an up close and personal look at the forces that have shaped our world. 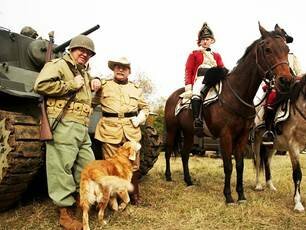 Interactive displays, rumbling tanks and knowledgeable living historians create a powerful family experience. Gates are open between 10:00 a.m. and 4:00 p.m. Adult admission is $10, with discounts for veterans and seniors, and $5 for children. OBVR provides visitors with a unique and wonderful opportunity to step back in time and experience life in a recreated mid-19th Century American village set on more than 200 acres. OBVR is located at 1303 Round Swamp Road in Old Bethpage (Exit 48 of the Long Island Expressway). For more information, please call (516) 572-8401 or visit www.nassaucountyny.gov/parks. Subject: LongIsland.com - Your Name sent you Article details of "Mangano Announces “Military Timeline” Weekend At Old Bethpage Village Restoration"